1961 was a remarkable year. The Beatles introduced themselves to the world, performing live for the first time at the Cavern Club in Liverpool, England. Over in the United States, John Kennedy was sworn in as president and boldly announced his intention to land a man on the moon by the end of the decade. 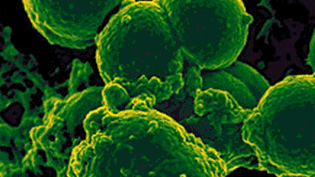 And there was this quiet little event far from the public eye that only decades later went on to capture the world’s attention — the birth of MRSA, first reported in the January edition of the British Medical Journal. For its first 3 decades of life MRSA was a well-behaved child in the sense that we always knew where to find it – in the hospital and only in the hospital. Its numbers increased over the years, and we noticed, too, that it was springing up in more and more hospitals across the world; first throughout the UK, then on to the US, Europe, Asia, & Australia. But what it didn’t ever do is go out into the community. Until the late 1990s. When without warning and for reasons we still don’t fully understand a Second Wave of MRSA hit, worldwide. It was turning up in schools, senior’s homes, hostels, prisons, and amongst sports teams – crowded places. In 2007 the Journal of the American Medical Association published an editorial reporting an explosion of MRSA in the US: there were some 90,000 cases that year in which about 20,000 people died. This state of affairs continues to this day but with a new twist.